The DeWALT DW7670 8-Inch Stacked Dado Set has heavy gauge, laser cut plates that provide true, accurate cuts. The micro-grain carbide teeth deliver clean cuts and reduce splintering. It has 4 tooth chippers that give smooth, flat bottom cuts and stainless steel shims that allow for ultra-fine width adjustments. 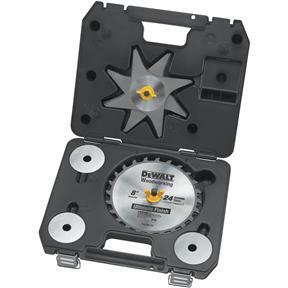 It includes a heavy duty storage case that protects the blades against chipped teeth and damage. 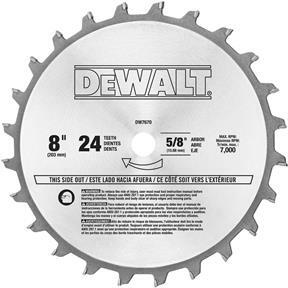 This blade is ideal for quality-conscious woodworkers, cabinetmakers and woodworking professionals. It makes clean, smooth dado cuts, rabbet cuts, tenons, and half-lap joints in hard woods, soft woods, plywood, and melamine. I actually haven't got to use this set yet, but it sure looks good. Yes very satisfied. This is our second set. Someone liked our first set enough to steal it. Precise clean dado cuts, with flat bottoms. Easy to use, when you stack the two outside cutters and 4 chippers, this produces a exact 3/4" dado. The case makes for easy storage. Four stars because it is very, very close to perfect.... and that says a lot considering the next level up is nearly 3X as costly.